With the advent of daily fantasy sports in 2007 the fantasy sports market exploded. For those uninitiated, daily fantasy sports leagues are markets where players compete in single day (or weekend) tournaments. This is in contrast to more traditional fantasy leagues that last an entire sports season. For example the popular television show "The League" is based on a traditional fantasy league. 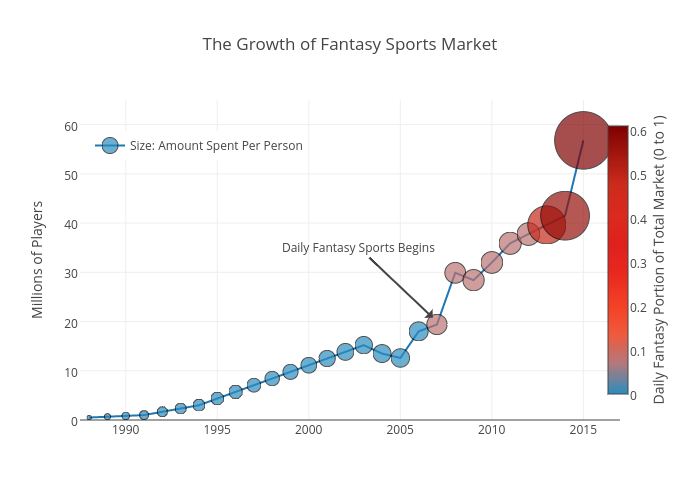 The market for fantasy sports in 2015 was roughly 24 Billion dollars. However, we may be seeing the peak as a growing list of states are taking steps to regulate the industry (like here). In addition, with daily fantasy sports being primarily played online this has created a robust opportunity for data science sharks to exploit new or naive players (like described here).